In a large stock pot, fill halfway with water, salt, and bring to a boil. Add linguine and cook according to package directions. Drain and set aside. In a medium bowl combine brown sugar, soy sauce, sriracha, and ginger; whisk well to combine; set aside. Return large stock pot to stove, heat over medium heat, add 1 TBS olive oil. Add beaten eggs and red pepper flakes and stir to scramble the eggs. Once cooked, set aside with pasta. Return large stock pot to stove, heat remaining 1 TBS oil over medium heat. Add zucchini, mushrooms, and garlic. Saute over medium high heat for 5-6 minutes or until veggies are cooked through. Turn heat down to low, add pasta and eggs back to pot, then pour the sauce mixture over the top. 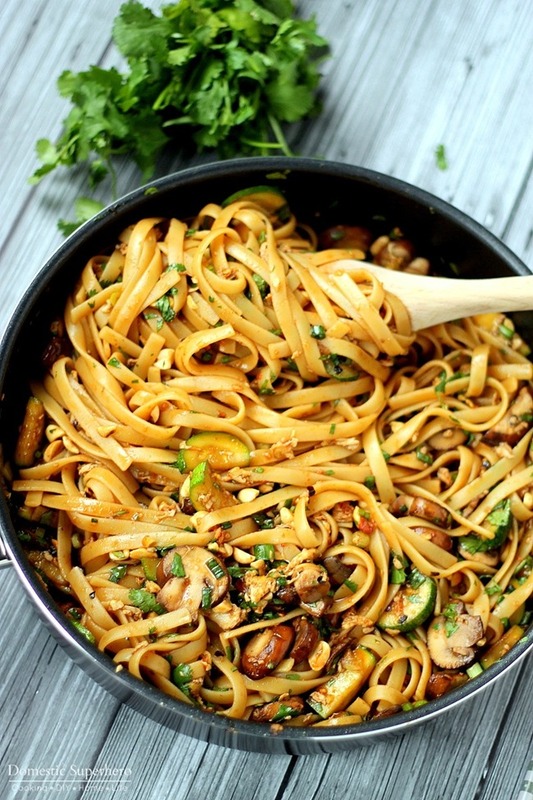 Using a wooden spoon, stir well to coat pasta and vegetables with sauce. Remove from heat, add peanuts, green onions, and cilantro; stir to combine. Notes: Serve warm or cold - it's great both ways! If you want to add a protein, I suggest cooking it after the eggs and then setting aside. If you add shrimp, you can add that in towards the end, when there is about 2-3 minutes left with for the veggies to cook. 0 Response to "One Pot Spicy Thai Noodles"